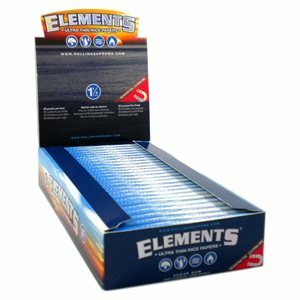 Elements rolling papers are world famous for their simple design of 100% chemical free rice paper and Acacia sugar gum. This pure rice paper burns with no ash and only leaves behind a slight caramel residue from the Acacia gum. This full sealed box includes a total of 825 Elements Ultra Thin 1½ sheets. Don't need a full box? We also have Elements Ultra Thin 1½ Single Packs.